Webfuel have recently deployed an open source Q&A platform for a department of Leicester University (RDS - Research Design Services). 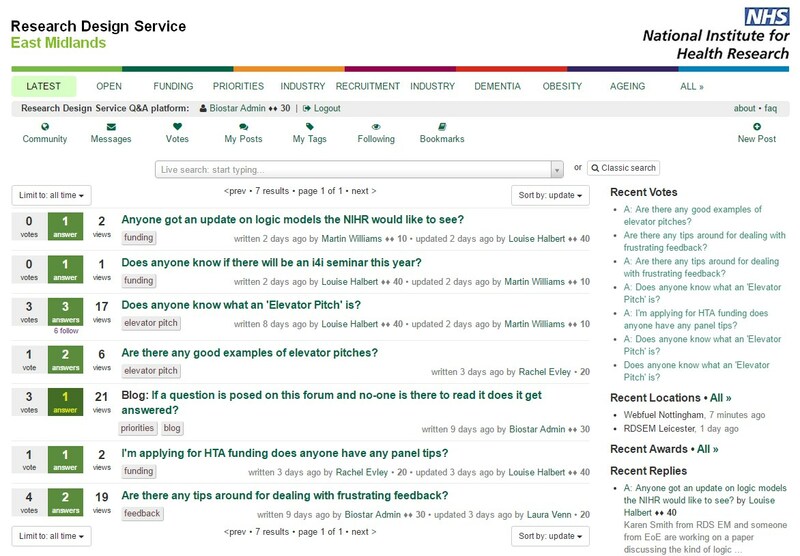 The tool allows RDS team members in Leicester and other RDS departments across the country to ask questions, provide answers and generally collaborate on building a knowledge base that can be used by all team members. The solution is based on a customised version of the open source Biostar Central software which is written using Python and the popular Django web framework. Webfuel customised the solution to meet several requirments that the original sofware did not provide, as well as branding it to the necessary RDS and NIHR branding. The software is very similar to the popular Stack Exchange Q&A websites (such as Stack Overflow). A screenshot of the software during testing can be seen below. The software is hosted in our cloud hosted infrastructure providing robust daily backup to 2 different data centres to ensure the valuable knowledge that is being accumulated in the application is safe and secure. The software can only be accessed by registered users (a feature the original open source implementation did not provide) which is obviously important when a potentially sensitive or proprietary knowledge base is being created. If you think a similar solution could be a useful tool to help your own teams collaborate, share and build knowledge then please let us know and we'd be happy to discuss how we can customise and deploy a similar solution for your organisation.